SARAWAK-based Naim Holdings Bhd (Naim), a property developer and construction group, will develop prime land in Batu Lintang, Kuching, into the state's biggest comprehensive mixed development project, costing more than RM300 million. Managing director Datuk Hasmi Hasnan said the proposed development would be sprawled over 13.597ha and be completed over 20 years. The project will comprise a four-storey shopping mall with basement car park, office tower block, hotel tower, a 36-storey office tower with basement and elevated carpark, showroom, 18-storey condominium block and a 27-storey high-rise apartment. "We will incorporate a water theme park, a roof garden and incorporate plenty of greeneries so as to come out with a development that is eviromental friendly and one that the local populace can enjoy and benefit from," he said. 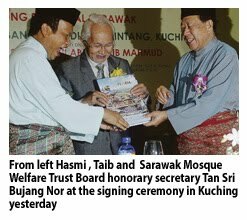 The project will be developed on a joint venture basis between Naim, Sarawak Mosque Welfare Trust Board and Tabung Baitulmal Sarawak. The three parties signed a memorandum of understanding to facilitate the venture witnessed by Chief Minister Tan Sri Abdul Taib Mahmud. Hasmi said Sarawak Mosque and Tabung Baitulmal will each have a 15 per cent equity in the project venture while Naim would hold the remaining 70 per cent. "We estimate employment for more than 2,000 people in the project," he said, without disclosing, when the construction will begin. Can the MRT address the long-term transport problem? MUCH will be said and written about the mass rapid transit (MRT) in the next several months with construction expected to begin in July this year. Some will be for it, others will be against it. At RM36.6bil, the public transport system will be one of the country's largest infrastructure projects. But this figure is for the civil works only. The prices of the trains and land acquisition have yet to be factored in. So the figure will certainly swell. Why not have more cars fitted to the two-car system? The building of this new MRT line as opposed to the current monorail and light rail transit must be seen from the perspective of what we know today as our public transport system. When the monorail and LRT were built in the mid-1990s, Klang Valley has a population of about 3 million. Today, we have a population of 6.6 million. By 2020, it is estimated to be 8 million. While we were building our monorail and LRT in the mid-1990s, Singapore was extending their MRT system with the first portion of the line ready for service in the late 1980s. Despite a population of just over 3 million in 1990, they opted for the MRT in the 1980s, and not the LRT, monorail or whatever. Today, Singapore's MRT is serving a population of more than 5 million people and that network is constantly being extended. Over in the Klang Valley, we were building two systems, the monorail and the LRT line. At that time, questions arose why we needed two systems and fragmentise public transport further. Why not have just one system? This question was never answered. The two systems lack integration. 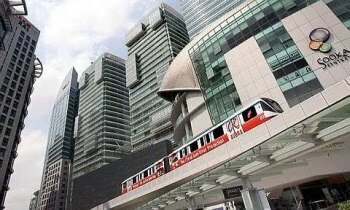 To use the monorail, one has to get off and get out of the LRT station, and walk some distance to get on the monorail line, for example between Dang Wangi and Bukit Nenas station. The people who designed, planned and built the LRT and monorail also did not factor in park-and-ride facilities. They just built a station where they can, put in a line and expect everyone to walk there in the sun and rain. The result is that today, there are cars parked under the electric lines which electrify the LRT and there is a charge to this. So, in addition to spending about RM5 on a return ticket, there is the RM5 parking charge. If one has to fork out RM10 to use the LRT or the monorail and yet at the same time, having to bear with the inconvenience, they may as well spend a bit more to have the convenience of driving to the city. That explains our low ridership. For every one ticket we sell, Singapore sells nine, London 16 and Tokyo 48. All of us know there is a cost to infrastructure. Whether it is road network, bandwidth or public transportation system, it is a sunk cost. As with most public infrastructure projects, there is no profit to be made from it. So the thing for the Government to do is to consider it as an investment for future years, for future generations. London's underground is about 150 years old. It was the first underground railway system in the world. Today, it serves the Greater London population of more than 7 million, which is about equivalent to Klang Valley's population. Greater London did not have a population of nearly 8 million some 150 years ago, yet they opted to build the underground. Closer home, Singapore did not have a population of 5 million 25 years ago. When and if we build this MRT, it will not be for the next 30 or 40 years. It is for posterity. In that sense, it need not be wasteful. But there is a need to be focused here. Do we want to sell more made in Malaysia cars to Malaysians or do we want to improve public transport? It is not possible to have both. One may ask, why not have more cars fitted to the present two-car LRT system? The LRT started with a two-car system. It can be fitted to a maximum of four cars. The LRT platform is designed to fit only four. The LRT has a carrying capacity of about 30,000 per hour per direction for a two-car system. So there is a cap to capacity. The MRT has 50% more carrying capacity and the car is 50% wider. What is wasteful is spending money on piecemeal solutions the LRT and monorail, for example to solve a eternal question that hovers around population growth and the need for public transport. What is wasteful is having two MRT stations just 400m apart from each other. What is wasteful is building the MRT, while ignoring and not improving the bus, taxi and Komuter system. Assistant news editor Thean Lee Cheng thinks there is a need to think very long term when investing in infrastructure projects. KUALA LUMPUR: Bina Puri Holdings Bhd said its wholly owned subsidiary, Bina Puri Properties Sdn Bhd has acquired a parcel of land in Kota Kinabalu, Sabah of about 1.95 acres for RM4.5mil. Group managing director Tan Sri Tee Hock Seng said in a statement yesterday that the land would be developed into a serviced residence, with an estimated gross development value of about RM60mil. The land will be used for the development of one block of service apartments consisting 100 units with sizes ranging from 1,500 sq ft to 4,500 sq ft. The land will be developed into a serviced residence, with an estimated gross development value of about RM60mil. EQUINE Capital Bhd’s wholly-owned subsidiary, Equine Park Country Resort Sdn Bhd, has signed a joint development agreement with Revenue Concept Sdn Bhd to develop a 3.6ha in Subang Jaya, Selangor, into a RM1 billion mixed commercial and residential development. The project will be carried out in phases over seven years, Equine said in a filing to Bursa Malaysia yesterday. TESCO Stores (Malaysia) Sdn Bhd is expanding its business in the northern region by opening three more outlets in Penang and Kedah within this year. Tesco Malaysia chief operating officer Tim Golding said the company wanted to bring its Tesco offers to more customers and the new outlets will be opened at Seri Tanjung Pinang in George Town, Penang, and in Kulim and Alor Star, Kedah. He said the new outlet at Seri Tanjung Pinang is expected to open in June. The company has invested RM20 million on setting up the leased outlet, making it a long-term tenant at the development, which has been said to be the largest seafront project in Penang's history. "Tesco Malaysia also has further developments in Alor Star and Kulim, where two more of our outlets will be opening this year. Both projects cost about RM50 million each," he said at the official launch of Tesco Bukit Mertajam at Jalan Rozhan yesterday. Tesco Bukit Mertajam, which measures 9,000 sq m, opened for business on September 23 last year and is Tesco Malaysia's 36th outlet in the country and Penang's fourth. Apart from more than 60,000 product lines in fresh food, groceries, apparel, electrical appliances, furniture and health and beauty items, the outlet also features over 50 shop units and 30 pushcart stalls. Golding said the new Alor Star outlet will be located in the Stargate township, a 124ha mixed development in Tandop. Tesco Kulim began constructions in September last year in Taman Lembah Impian. The two-storey hypermarket is expected to be completed in the second quarter of this year. Golding said Malaysia was a fantastic market for Tesco, which plans to open seven to eight new outlets annually. The company is presently in planning stages for the new outlets nationwide. He added that Tesco Malaysia also boasts a 100 per cent local employment rate, with Malaysians filling various positions in the company across the country. Tesco Malaysia government relations and legal affairs director Azlam Shah Alias said for 2011, the company would invest an estimated RM500 million. It was reported earlier this month that Tesco Malaysia has plans to invest RM280 million and open four more hypermarkets over 12 months starting from March, bringing the total number of stores it has nationwide to 40. Tesco Malaysia started operations here in 2002 with its first store in Puchong, Selangor, and has invested over RM3 billion since. Last year, it recorded RM3.6 billion in revenue. KUALA LUMPUR: GSB Group Bhd's unit, Serta Usaha Sdn Bhd (SUSB), has entered into a conditional sale and purchase agreement with Leopad Holdings Sdn Bhd to sell its property, comprising land and a 13-storey hotel, for RM22mil cash. The property is situated in Jalan Kapar, off Jalan Syed Putra, in Kuala Lumpur. GSB, in a filing to Bursa Malaysia yesterday, said the proposed sale is expected to be completed within eight months from the date of the agreement.